Since its global debut as Durban's host venue for the 2012 FIFA World Cup, Moses Mabhida Stadium has quickly become a firm favourite with locals and visitors alike. It has been as the chosen venue for a variety of mega events such as international and local football matches including Bafana Bafana, AmaZulu, Golden Arrows, Kaizer Chiefs, Orlando Pirates and Manchester United. Showing its diversity it have also been home to South Africa v India Pro 20 Cricket, Top Gear Festival, Amashova Cycle Race, Spar Ladies Race, East Coast Radio's Big Walk and Durban Day, concerts, political rallies and cultural festivals. With a number of exhilarating attractions, the monthly I Heart Market and a thriving shopping and eating area it has more than enough on offer to ensure that it is a popular venue everyday of the week, and not just on match days. The unique attractions offer a trip on the SkyCar to marvel at the 360 views of the city and ocean, a brave jump out on the Big Swing, the 500-step adventure walk up the iconic arch or a Segway Gliding Tour. You can also go behind the scenes on an Express or All Access stadium tour or visit the stores and restaurants after you adventures. Nearly 500 000 visitors have tried out the SkyCar, Adventure Walk, Stadium Tours and Big Swing making this a must-see for locals and tourists. More than 300 corporate functions, dinner parties, conferences, weddings and product launches have been held in a variety of top-notch eventing venues around the stadium. From the exclusive Presidential Suite and Platinum Club to the grandeur of the Mixed Zone, 10 different venues offer spectacular views, from the Durban cityscape, the arch and the lush pitch. It is also a patron of the arts, containing beautiful commissioned pieces by local artists. For occasions of a different kind, there are a number of suites for hire during the stadium's sporting and entertainment events giving people the chance to watch the action on the pitch in style. 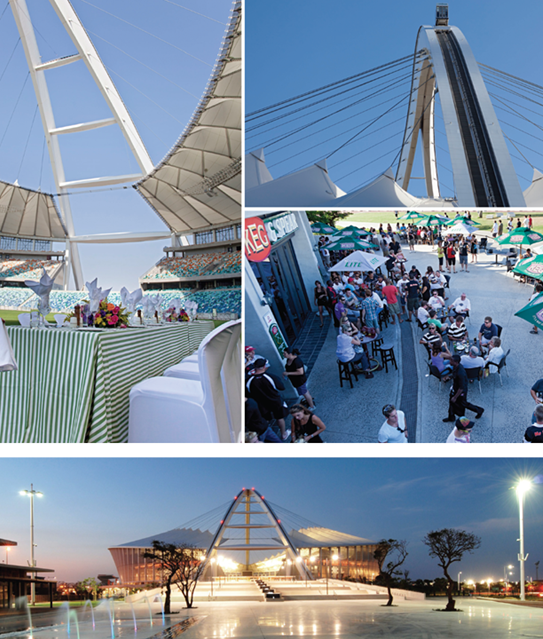 So, whether you're looking for an exciting day out, some retail therapy, or a great venue for your next occasion, Moses Mabhida Stadium has it all. Since its global debut as Durban's host venue for the FIFA World Cup, Moses Mabhida Stadium has quickly become a firm favourite with locals and visitors alike. With a number of exhilarating attractions and a thriving retail zone, it has more than enough on offer to ensure that it is a popular venue week-round, and not just on match days. The commercial facet of the stadium is complemented by top-notch eventing venues, with the ability to offer a level of hospitality that ensures that every occasion is a success. From the intimate Gold Business Club 1 to the grandeur of the Mixed Zone, Moses Mabhida Stadium can accommodate events from cocktail parties, to multimedia displays to banqueting and more. It's no wonder that the stadium is a popular eventing venue. Its different rooms offer spectacular views, from the Durban cityscape to the lush pitch. It is also a patron of the arts, containing beautiful commissioned pieces by local artists. With its soaring arch and distinctive architecture it has quickly become a Durban icon, and favourite fixture in the city's skyline. For occasions of a different kind, there are a number of suites for hire during the stadium's sporting and entertainment events. This gives people an opportunity to watch the action on the pitch in style, and is sure to make for a memorable event for all those invited. 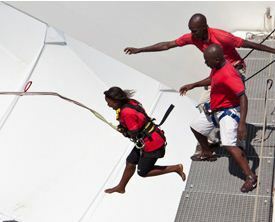 The unique attractions at the stadium also add excitement and adventure to any day out, whether it's a trip on the Sky-Car to marvel at the 360 views of the city, a brave jump out on the Big Swing, or the 550-step adventure walk up the iconic arch. There are also a number of stores and restaurants at the stadium for those who are less thrill-seeking in their ambitions. conference venues, suite leasing and hospitality packages.